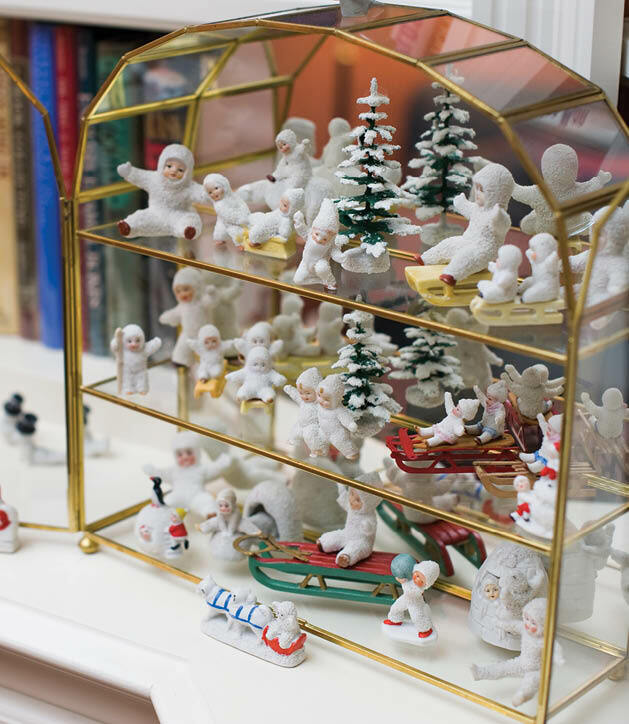 Edina collector decorates with antique ornaments. It’s the most wonderful time of the year for Edina resident Elvi Bankey, who spends up to two months adorning her home with a beautiful display of antique Christmas decorations. Bankey has always enjoyed decorating for the holidays. “It’s a happy time of year,” she says. But she admits she caught a bit of Christmas mania when she attended her first Golden Glow of Christmas Past convention in Minneapolis in 1989. 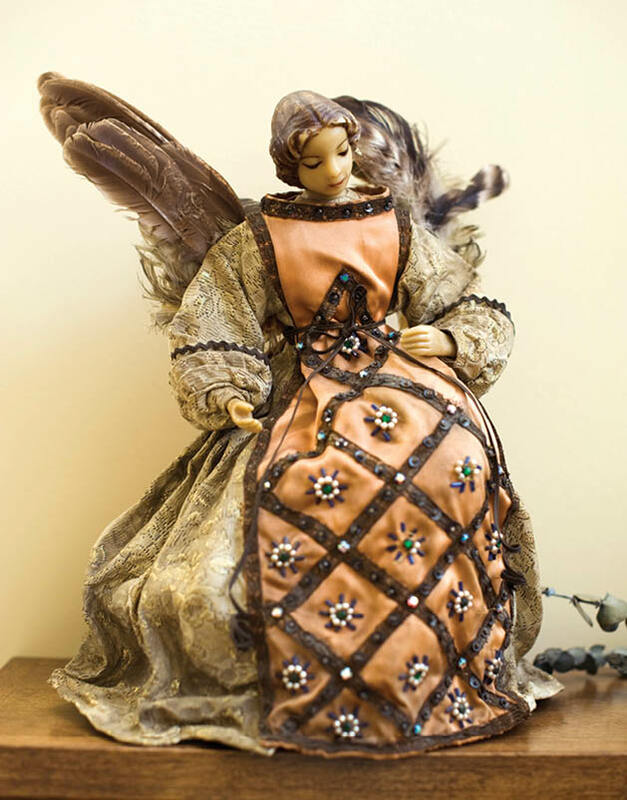 Golden Glow is a nationwide club whose members are authorities on antique Christmas collectables and traditions. “Glow members taught me how to collect antique Christmas decorations,” says Bankey, who’s rarely missed a Glow convention in 25 years. She’s accumulated much of her collection from other convention attendees but has also obtained treasures from her travels abroad to places like Germany and Scandinavia. But one of her favorite convention destinations is Lancaster, Pennsylvania, near the National Christmas Museum. Bankey’s knowledge of Christmas traditions is extensive, and she enjoys telling tales of Christmases past—like the fact that Americans didn’t do much decorating for Christmas until Woolworth’s began selling German-made glass ornaments in the early 1900s, and that ornaments must have been made prior to 1960 to be considered antique, according to Golden Glow. Bankey says her late husband Edward always appreciated her love of Christmas. “He liked how the decorations made our home festive,” she says. Part of the Bankeys’ family tradition was to give a new ornament to each of their children each year, a tradition their daughter Lisa Bale says she’s passed down to her own children. “It’s fun to decorate the tree with good memories of past Christmases,” says Bankey. To help you get into the holiday spirit, we’ve spotlighted a few treasures from Bankey’s collection so you can get a glimpse into her enchanting holiday home. 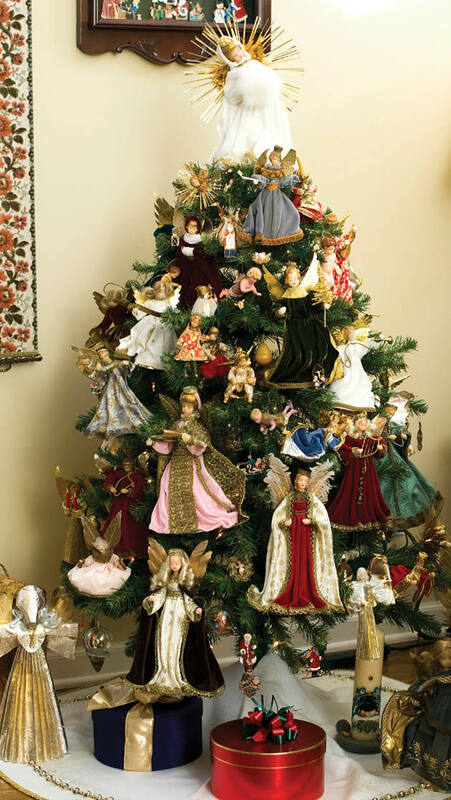 One of Bankey’s assorted Christmas trees is adorned almost exclusively with antique wax angel figurines. Most were made prior to World War II, in the 1920s and 1930s. Detailed molds were used to create the heads, hands and feet of these heirloom pieces. Their expressions are hand-painted, and their garments are often made from fine fabrics. These types of decorations are still in production today, and newer versions can often be found online. Perched on a mantelpiece above the fireplace is a pair of treasured wax angels. Made in the 1920s, these are the oldest pieces in the collection. Italian-made with genuine feathers for wings, wearing beaded brocade and satin gowns, these delicate beauties seem to smile demurely over the classically decorated room. One of the many incarnations of Santa Claus is a German Belsnickel. 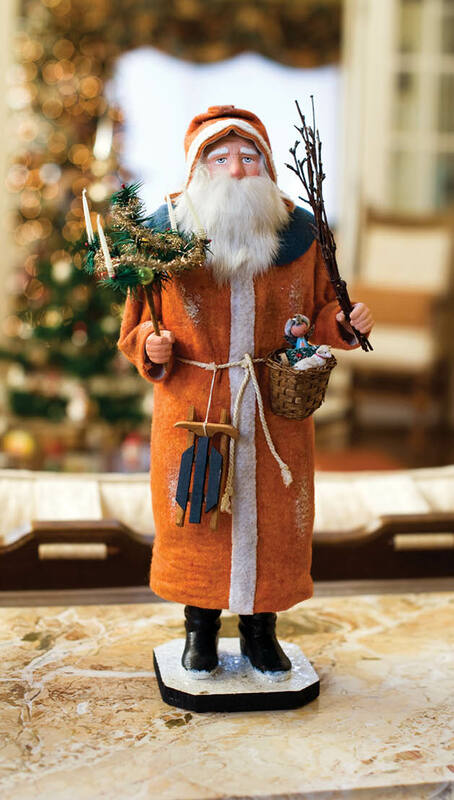 Bankey’s antique reproduction of this somber old gift-giver is carved from wood, wears the traditional gown of an old-time St. Nicholas and is bearded with rabbit fur. He carries an Advent wreath made of goose feathers and a basket of miniature German toys. Fun fact: The American version of a plump and jolly Santa Claus, wearing a fur-trimmed coat and pants, is derived from early Coca-Cola marketing campaigns and was further ingrained into the American psyche by the classic story ’Twas the Night Before Christmas. 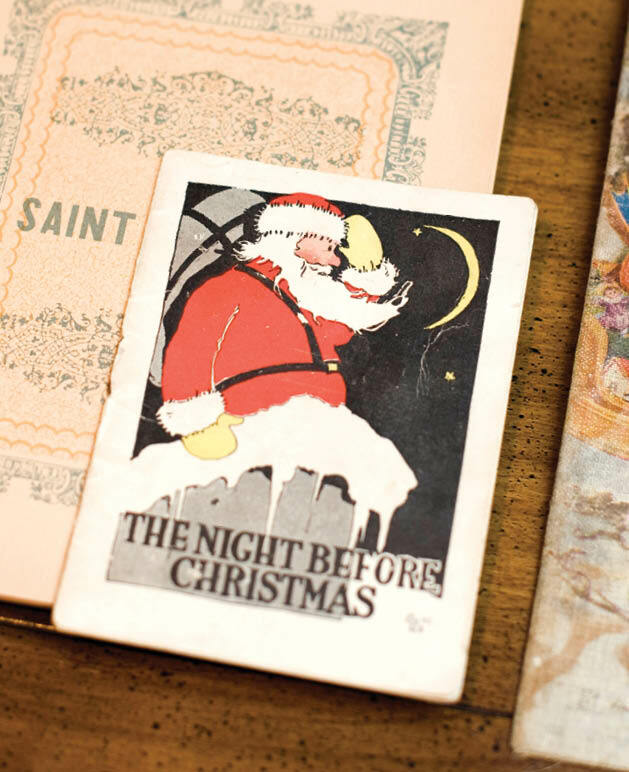 Speaking of this beloved tale, Bankey has acquired several antique copies of the storybook, including one that was a store giveaway to visitors of Dayton’s Christmas display in the 1920s. 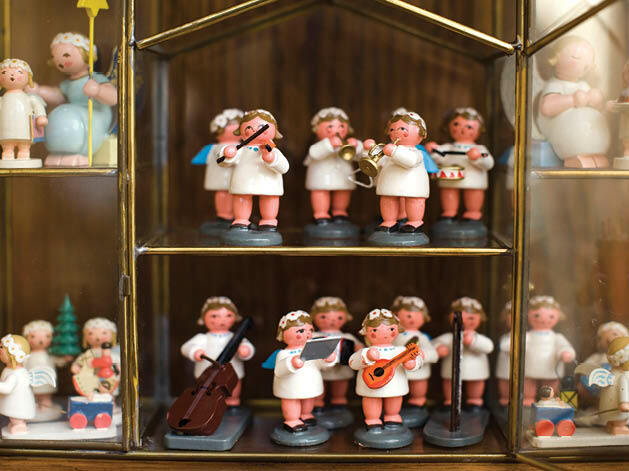 More homage to Santa Claus is on display in a set of Bavarian “flats.” These hand-cast ornaments are created by Wilhelm-Schweizer-Zinnifiguren in a centuries-old tradition. Bankey’s pieces date from the 1980s to the present; current versions often can be found at shops like Ampersand in the Galleria. The modern Santa Claus is rarely depicted without his eight tiny reindeer. So it’s only fitting that Bankey would have a set of tiny, blown-glass mercury reindeer from the 1930s. These fragile tabletop ornaments are intricate pieces of art. Most are silver, so colored pieces are considered a rare find. And a wintry holiday scene isn’t quite complete without a sweet sampling of Snowbabies. These bundled babies made of bisqueware were once sold for a nickel or a dime and used to decorate cake tops or as party favors for dinner guests. Then a Snowbaby was created to commemorate explorer Robert Peary’s 1909 expedition to the North Pole, setting off a craze of Snowbaby collectibles. Bankey prefers German-made Snowbabies, many of which were designed by Hertwig and Co. Department 56 is probably the best-known seller of Snowbabies; virtually hundreds of these charming collectables are available from a variety of retailers and resellers. The eye is drawn from one bauble to the next: German glass icicles, spun-cotton fruits, antique postcards, old-fashioned Christmas stockings and cornucopias once used for giving holiday candies. If this vintage wonderland doesn’t inspire you to begin your own collection, it might at least inspire you to put a log on the fire and bake cookies from Grandma’s old recipe.